The three masked musicians in this painting represent comic figures from the tradition of popular theater in Italy. This Cubist concert features Harlequin playing a violin, Pierrot witha recorder, and a Franciscan friar holding an accordion. The painting has been interpreted as a nostalgic elegy to a trio of friends: the recently deceased poet and critic Guillaume Apollinaire (Pierrot), the poet Max Jacob (the friar), and Picasso himself as the Harlequin. 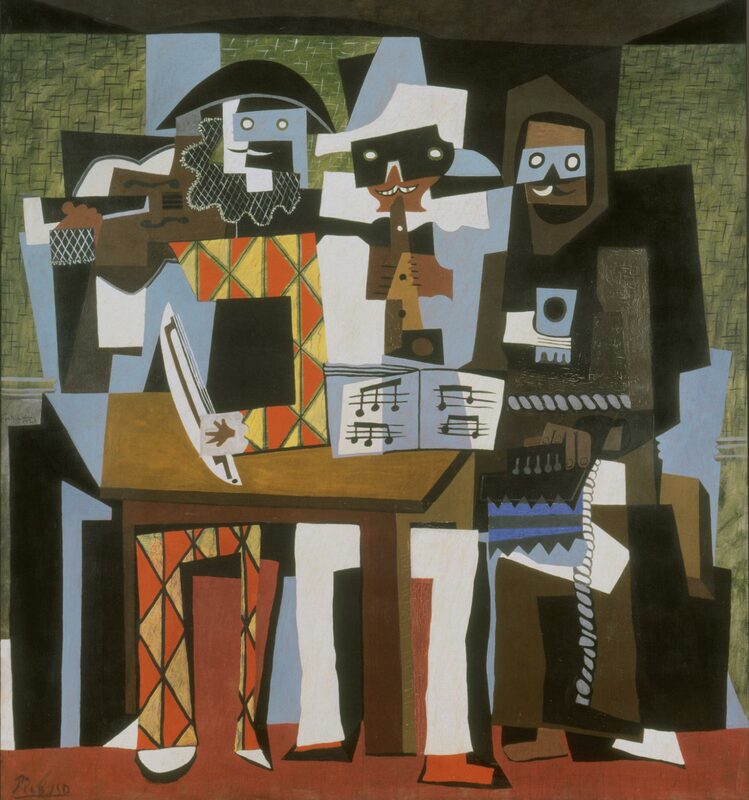 Picasso and the Avant-Garde in Paris: Picasso's "Three Musicians"
Three Musicians, with its flat, patterned shapes echoing the cut and pasted papers of the artist's earlier collages, provides a grand summation of Picasso's late Cubist style. Music was a favorite theme of the Cubists, and here Picasso equips the Harlequin figure with a violin, Pierrot with a recorder, and the monk with an accordion. The three characters, who figure prominently in the history of painting and in Picasso's earlier work, derive from Italian, French, and Spanish popular theater and carnival traditions, but the artist had encountered them more directly during recent visits to Italy as the set designer for Sergei Diaghilev's Ballets Russes. A year before he painted Three Musicians, Picasso had designed costumes for Diaghilev's ballet Pulcinella, of which the choreography was based on commedia dell'arte. Indeed, the stagelike space of this monumental composition may be traced to Picasso's work for the theater. The peculiar triumvirate of characters has been interpreted as a commemoration of the recently deceased poet Guillaume Apollinaire in the form of Pierrot, with the poet Max Jacob as the friar and Picasso himself as Harlequin, the sad clown figure with whom he had identified in his early work. Emily Hage, from Masterpieces from the Philadelphia Museum of Art: Impressionism and Modern Art (2007), p. 120. Three Musicians provides a grand summation of Pablo Picasso's decade-long exploration of Synthetic Cubism, with its flat, patterned shapes, although painted in oil, echoing the cut and pasted papers of his collages of the period. Music was a favorite Cubist theme, and here Picasso equips Harlequin with a violin, Pierrot with a recorder, and the monk with an accordion. All three characters, which figure importantly in the history of painting and in Picasso's own earlier work, are derived from Italian, French, and Spanish popular theater and carnival traditions, but the artist had also encountered them more directly during recent visits to Italy as the set designer for Sergei Diaghilev's ballet. Indeed, the stagelike space of this monumental composition may be traced to Picasso's theatrical work. Quite probably a portrayal of Picasso himself (Harlequin) and two poet friends, the painting presents an allegory of the artist as performer, a major theme of Picasso's highly autobiographical work throughout his long life. Ann Temkin, from Philadelphia Museum of Art: Handbook of the Collections (1995), p. 318. Picasso painted Three Musicians in the garage of the villa he rented at Fontainebleau for the summer of 1921. This solemnly majestic oil painting, with its flat, patterned shapes echoing the cut and pasted papers of his collages, provides a grand summation of the artist's decade-long exploration of Synthetic Cubism. The three masked figures, with their sinister smiles and humorous false mustaches, are rendered in flat, overlapping planes that give them an intangible, paper-thin quality, which increases the strange, otherworldly atmosphere of this Cubist concert. Like actors on a stage, the musicians are arranged frontally in a shallow, boxlike space. Harlequin holds a violin and bow, Pierrot plays a clarinet (or recorder) above a sheet of music unfolded on the table, and a Franciscan friar in a homespun habit with a rope for his belt holds an accordion. The appearance of costumed figures, derived from Italian popular theater and carnival traditions, also relates to Picasso's collaboration, beginning in 1917, with the Russian ballet. In the year before he painted Three Musicians, Picasso had designed costumes for Sergei Diaghilev's ballet Pulcinella, which had choreography based directly on commedia dell'arte types. The painting has also been interpreted as a symbolic and nostalgic elegy to Picasso's poet friends or his own lost bohemian youth.1 According to this biographical reading, the mysterious triumvirate commemorates the recently deceased Guillaume Apollinaire, in the form of Pierrot, with the poet Max Jacob as the friar and Picasso himself as Harlequin, the sad-clown figure with whom he had identified in his earlier work. Picasso refused to part with the work for many years, before finally letting A. E. Gallatin acquire it for his Gallery of Living Art in New York in 1936. Gallatin was able to purchase the painting just before the Museum of Modern Art, which later bought another version of the subject. Twentieth Century Painting and Sculpture in the Philadelphia Museum of Art (2000), p. 59. 1) Theodore Reff, "Picasso's Three Musicians: Maskers, Artists & Friends", Art in America, vol. 68, no. 10 (December 1980), pp. 124–42. Consigned by the artist to Galerie Paul Rosenberg, Paris, January 21, 1925 ; with Rosenberg until c. 1927 (exchanged it and other paintings with Reber for a Cézanne); Dr. Gottlieb Friedrich Reber (1880-1959), Lausanne, 1927-1936 (possibly in the possession of a creditor 1934-1936) ; with Zwemmer Gallery, London; sold to A. E. Gallatin and George L. K. Morris, NY, September 18, 1936 ; bequest of A. E. Gallatin to PMA, 1952. 1. Elizabeth Hutton Turner, Duncan Phillips Collects: Paris Between the Wars, Washington, DC, 1991, p. 43-45 and n. 92, citing Paul Rosenberg Papers, Pierpont Morgan Library. 2. Reber underwent financial difficulties as a result of the Depression: Alfred H. Barr wrote to MOMA trustee Stephen C. Clark on July 13, 1934, that the painting 'formerly in the Reber Collection, is now apparently in the possession of a bank following Reber's recent collapse on the Paris bourse'; see Dorothy Kosinski, "G. F. Reber: Collector of Cubism," Burlington Magazine, v. 133, August 1991, p. 526. 3. The Zwemmer Gallery ledger records the sale to Gallatin on September 18, 1936, with a note that the work was being sent to New York directly from Lausanne; see Nigel Vaux Halliday, More Than a Bookshop: Zwemmer's and Art in the 20th Century, London, 1991, p. 183. In addition, a letter of Alfred Barr (who was campaigning to acquire the painting for MOMA at the time) dated July 31, 1936, notes that Zwemmer was offering the painting. The Mayor Gallery in London may also have been involved in the sale: Morris' painted receipt (Gallatin Papers, New York Historical Society) for his half of the payment for the painting refers to the Mayor Gallery and not to Zwemmer; repro. in Susan Larsen, "Albert Gallatin: the 'Park Avenue Cubist' Who Went Downtown," Art News, December 1978, p. 80. The Mayor Gallery, however, has no record of this transaction, as indicated to Gail Stavitsky by Andrew Murray, Director, letter of April 21, 1989, and by Dorothy Kosinski, curator of the Douglas Cooper Collection; see Gail Stavitsky, The Development, Institutionalization, and Impact of the A.E. Gallatin Collection of Modern Art [Ph. D. dissertation, New York University], 1990, v. 9, p. 240, and letter from Stavitsky dated 19 October 1989 in curatorial file. Nevertheless the Mayor Gallery's connection with Reber is well documented; Douglas Cooper, who was one of the gallery's directors from 1933 to 1937 or 1938, bought fifteen works from Reber in the 1930's (see Dorothy Kosinski, Picasso, Braque, Gris, Léger: Douglas Cooper Collecting Cubism, Houston, 1990, p. 22).